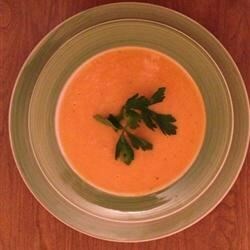 "A rich and savory vegan butternut squash soup recipe to make for lunches during the week or for the beginning of a delicious meal. For an added richness, I prefer to roast the squash in the oven for 30 minutes before adding to the soup stock. Other fall squash varieties work well too, but my favorite is butternut. Garnish with fresh parsley." Cut off the top 1/4-inch of the garlic cloves and brush the cut cloves with a small amount of olive oil. Wrap in aluminum foil. Bake in the preheated oven until cloves are tender and browned, about 45 minutes. Let cool until safe to handle, about 5 minutes; chop. Heat olive oil in a 5-quart pot over medium-high heat. Add garlic and onion; saute until onion is translucent, about 5 minutes. Add butternut squash and broth. Season with salt and pepper. Bring to a boil, reduce heat, and simmer until squash is soft, about 30 minutes. Remove soup from heat and let cool slightly, about 30 minutes. Fill blender halfway with soup. Add about 1/2 cup of almond milk. Cover and hold lid down with a potholder; pulse a few times before leaving on to blend for 1 minute. Pour into a pot. Repeat with remaining soup and almond milk. Return soup to the stove over low heat before serving; cook until heated through, about 3 minutes. Try mushroom broth in place of vegetable broth, if you prefer.